In 1893, a literary critic in the Galveston Daily News lamented that the many women writers in the state, "women of noble talents," had largely gone unnoticed by the literary industry. Her lament has reverberated throughout the past century, as women's letters in Texas have been further marginalized by the male canonmakers who paid tribute to the Texas Mystique--oil derricks, cowboys, and the Alamo: masculine western icons that shaped a region's literature. 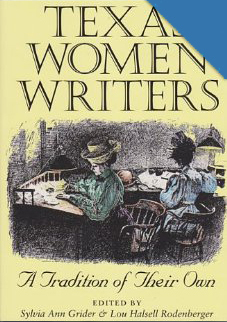 Texas Women Writers: A Tradition of Their Own is a sweeping account of a rich yet largely ignored literary history covering over 160 years of women's writing in the Lone Star State. Their writings vary widely in theme, setting, and voice; nevertheless these writers share a distinct tradition that is in part defined by their isolation due to both geography and gender and is wholly different from their male counterparts'. The survey begins with pioneer diarists who chronicled their experiences on the Texas frontier, and it ends with the postmodernists and a glimpse of the new directions in which Texas' women writers are now heading. In between are critical-biographical portraits of the lives and careers of individual writers both major and minor: from novelists, dramatists, and poets, to writers of short stories, children's books, and creative nonfiction. The survey covers the developmental history of major genres in the region and chronologically reviews each generation and the particular challenges of time and place that shaped their work. The careers of African American and Tejana writers are also examined as part of newly emerging literary traditions. Edited by Lou Halsell Rodenberger and Sylvia Ann Grider, this volume brings together a host of contributors comprising some of the region's most prominent scholar-writers. The editors also list primary and important secondary material in perhaps the most comprehensive bibliography ever devoted to Texas women's literature. Texas Women Writers will introduce many readers to a vibrant literary tradition that is unique to the Texas experience. The enveloping pace of this book is wonderfully integrated with information. I was delighted to recognize authors I did not know had Texas roots. My out-of-state visitors also found authors they had read and loved, and in one instance, knew personally. It is time to recognize the past and present talent in Texas. This book's charm is not limited to Texans, or women only.